We’re calling it: The debate over quantity vs. quality is over. Quality wins. But what does quality content really mean? How do marketers guarantee that they are creating something that is high quality? We asked the experts presenting at Content Marketing World 2017 how they define and achieve quality content. 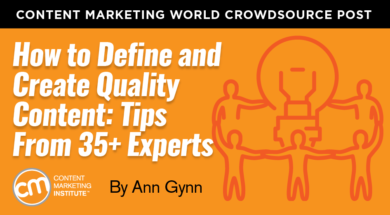 Read on for 35 more explanations and tips to help you create quality content for your brand from experts from Google, Microsoft, REI, Monster, as well as agencies, government, and more. Check the one-box answers on Google. How do you stack up when Google gives only one answer to the question? How do your competitors? Another way is to ask your customers to rank content in real life. Show them three or four pieces of content (without branding) and ask them to stack the content in terms of ability to solve their problem. Anything that adds value to the reader is quality content. It’s industry-focused, not trite and trivial. It increases a reader’s understanding of a topic in a way they may not have been aware of. To “guarantee” high quality content, put yourself in your reader’s place and ask these questions: Is it relevant? Is it educational? Does it add value? Your real competition is buyer inertia, apathy, and indifference. Quality content leverages urgent buyer concerns to break the ice of customer indifference and encourage deeper engagement – with you. Quality content attracts the marketer’s target audience by being entertaining or useful. You can know if your content is up to snuff by measuring it against KPIs that demonstrate actual business value (sales, brand lift, marketing efficiency, increased leads, shorter time to conversion, etc.). But beware vanity metrics! Mere traffic or engagement in the form of likes and shares is nice but not good enough. Quality content is honest, clear, and serves no hidden agendas. The audience is smart and will see right through content that pretends to be one thing but is actually a veiled attempt at generating transactions. It’s about finding the right balance of providing quality content through the various mediums and touch points with prospects and customers in the right amount. Since the content should always be of high quality and relevance to the user, it’s more about finding the right moment to become successful. What my audience really cares about is what they care about, not what I care about. We have to get out of our own way and help our audience by giving them what they want. “High quality” is the information that’s most relevant to them from what they want to know and what we want to tell them. If content isn’t created with a specific target audience in mind, it’s just a spray-and-pray strategy. Improve the quality of the content by segmenting the audience. Think about when and how a piece of content can be useful to a specific target group. But there is a flip side to segmented work – it takes much more time. Quality content is useful, based on actual statistics or experience, and unique — not available anywhere else. If people need something and you make it easy for them to find it, they’ll come. I try always to consider not only the substance of content, but the structure of it, too. How does an audience likely want to consume content? Does an audience want to read long narratives to glean what happened at a conference? We doubted it, so our team endeavored to take a more “sound bite” approach, covering individual sessions with quotations from speakers, research highlights, practical tips, and more, rather than straight articles. In covering a tour of a revitalized neighborhood, I used precise times to move our coverage along so it would pique curiosity for our readers – what I call time-stamped reporting. Quality content employs alternative formats – bullet point format, time-stamped reporting, list format, and more – so the audience can consume content in interesting ways. Good content is relevant to your target audience. Great content also offers a level of cultural relevance. Why? Culture contains the ideas, convictions, beliefs, and implicit theories of the world we live in. Culture is what ultimately drives us and our decision-making process. Thus, letting your content speak through a filter of cultural relevance will make it a lot more likely to resonate and build long-lasting, meaningful relationships with your target audience. Quality content delivers value today as well as serves its readers for many years to come. In my experience, the content must offer utility and be able to be implemented instantly. The best way to guarantee quality is to revamp and improve existing content that is performing well. Take a winner and make it better and keep it evergreen. Another way of saying “quality content” is “engaging content.” If content is engaging to an audience, then it has a level of quality. For example, some people don’t look at tip lists as quality, but in reality, some media like BuzzFeed and Mashable have had a lot of success with these lists because they are extremely amusing, which is quality for their readers. I use the acronym IDEA to guarantee quality. If it’s industry-leading, data-driven, educational, and amusing, it’s typically a win with an audience. John Hall, CEO, Influence & Co.
Quality content is content your audience needs and can’t get anywhere else. It’s not “me-too” content – it’s content you’ve created in response to having a thorough understanding of the challenges your community faces each day. Ask yourself what special areas of expertise or data do you have internally to use for the benefit of our audience? That’s the type of content you should pursue, rather than clickbait “10 Things Marketers Can Learn From the Latest Social Media Meme” content. I prefer to use the term “value.” You need to provide something of value to your audience and the more value you provide the better. Research what your competitors are providing and provide content more valuable. For example, imagine there were hundreds of articles related to building a persona for content marketing. Instead of creating another article, create a software program to help build personas automatically. This is what HubSpot did. Your target audience can tell you if your content quality is crap. You need to test content with a small segment of your target audience and get their reaction first. Too many marketers are guessing instead of using secondary and first-hand research to see what will succeed. Research reduces risk. I think it starts with your audience. Talk to them – not once, but often. How are their needs changing month to month and year to year? We all think we know our audiences, but no persona is as good as actually listening to their needs. Data can show you trends, but people’s needs are often irrational and unpredictable. On the science side, the content meets the intent of a consumer, and that’s indicated and measured by engagement with the content. On the art side, the content has an aesthetic and style that meets the taste of a consumer. This is harder to measure but as important. It isn’t enough to say, “this happened” or “this is going on.” High quality content synthesizes ideas and draws a conclusion, curates and brings together resources, or surprises and delights the audience. Metrics such as downloads or page views tell us that buyers are searching for answers, but we still don’t know if the content we delivered was thorough and compelling. Begin with clarity about the questions buyers and customers are asking throughout their journey. Personas need to be based on in-depth interviews with real people who have navigated an actual buying decision, revealing deep insight into the buyers’ struggle to understand their options and make an informed choice. Making stuff up is always going to be a hit-or-miss proposition. Anyone crafting content must put him or herself in the reader’s shoes at all times. If you don’t know enough to get inside the reader’s head, do as much research as necessary until you are confident you understand their professional challenges, buying habits, wants, needs, and pain points. Ensure that writers and other content producers are capable of (and are) putting the audience first. Ideation is the key to quality content. The process involves searching for content that exists on your topic, and evaluating what’s been said, where it’s been said, how it’s been presented, and who said it. It also involves ensuring that your topic is what your audience is searching for. We’ve been implementing long-form, high-quality content, which Moz’s Rand Fishkin calls “10x content.” It uses ideation to identify the top post on a given topic and then creating content that’s 10 times better – going deeper on a topic and enhancing it with videos, images, and graphics. We’ve been doing this on our own blog for over a year now, and have seen organic traffic to our blog increase almost 50%. Quality is really determined by our audience – prospects, customers, and agents. If they find it useful – which we can tell from the data and feedback – it may likely be quality. We aim to build on an insight and create content that is highly usable and/or inspiring to our audiences. That’s quality. Quality content is original, maybe even counterintuitive. Quality content is detailed and covers the topic from many angles. But it’s tight. Not a word is wasted. And it’s often highly visual and easy to consume. There is no guarantee, but if you go beyond what your audience expects, you’re on the right track. Look for clues in your data. Attribution from reliable sources, quantifiable evidence, unique perspectives, and exclusive/unique points of view are the characteristics of quality content. Quality content converts. It gets more people to subscribe to your blog, generates more downloads, and creates more leads for your business. Track the results of your content – stack pieces next to each other against your metrics. You’ll see patterns emerge of the assets that lead to the most conversions, and then you can make more content like it. Marketers need to get stingier about what qualifies as an insight versus what’s just plain old information. An insight will register as unexpected. It will destabilize a prospect’s understanding of their world, making them rethink how they’re doing things today. Information, on the other hand, simply confirms already established or already inferable truths – what I call “true but useless” information. I consider five parameters and aim to get at least three of them to fit. Is the content (1) original, (2) relevant (to the platform and the audience), (3) timely (in terms of current issues, topics, or events), (4) optimized (not just for the platform and audience itself but includes a call to action), and (5) snackable. Valuable content – content that drives revenue at the end of the day – is only found at the intersection of three things: relevance to your audience, consistently delivered on the same channel, and a higher quality than anyone else is creating in the marketplace today. Quality means hitting that sweet spot in the consumer’s heart. You know the one – where someone has a flutter of “the feels” after watching or reading a piece of content and it resonates in some manner. After consuming your content, readers or viewers walk away with advice, steps, or insight they can apply to a job they need to get done. Additionally, they can get through the content in a reasonable amount of time and are engaged enough to keep reading or viewing all the way through. Quality can be boiled down to the answer to two questions: (1) Is your content addressing your customers’ needs? and (2) Are your customers walking away satisfied with how you’re addressing their needs? Your audience – It informs, entertains, and changes a way of thinking. It connects with the brain, connects with the heart, and connects with their desires. Your business objectives – It drives your audience through the customer journey by helping create awareness and interest, and developing quality leads that convert to sales and nurtures customers after the sale. Your organization – It helps the sales team nurture leads. PR can tell great stories to enhance the brand. HR can use it to recruit quality employees. Customer service can use it to minimize call times and develop satisfied customers. Bring it all together by making your content strategy a cornerstone to your customer experience strategy. Your community – It highlights the partners within your supply chain. Pull in influencers and thought leaders who resonate with your audience. Collaborate with complimentary suppliers within your industry to elevate the bigger story. Leverage internal expertise with employee advocacy. Encourage user-generated content to drive customer advocacy. You can meet and learn from these experts as they present at Content Marketing World 2017 Sept. 5-8 in Cleveland, Ohio. Register today and use the code BLOG100 to save $100.